W1003: Face of Cauac Sky Quirigua is about 7200 miles from Egypt and its zenith was some 1000 years after the last native Pharaoh ruled there, and yet there are some remarkable similarities that seem to add up to more than coincidence. 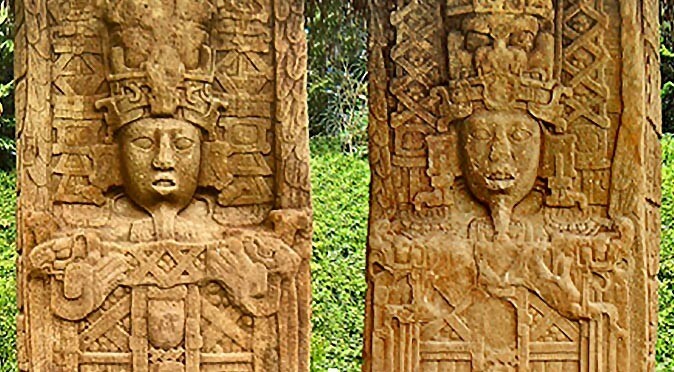 The majority of the stelae and zoomorphs at Quirigua feature the unusually pharaonic looking face of Cauac Sky (officially named K’ak’ Tiliw Chan Yopaat). Fig. W1003 is the image of Cauac Sky appearing from a turtle shell on a monument known as Zoomorph B and shows that he wore a long goatee beard that is very reminiscent of those that feature so prominently in the portraits of Egyptian Pharaohs. This type of facial hair is seldom seen in Mesoamerican art and is restricted to mythical creations and Gods. 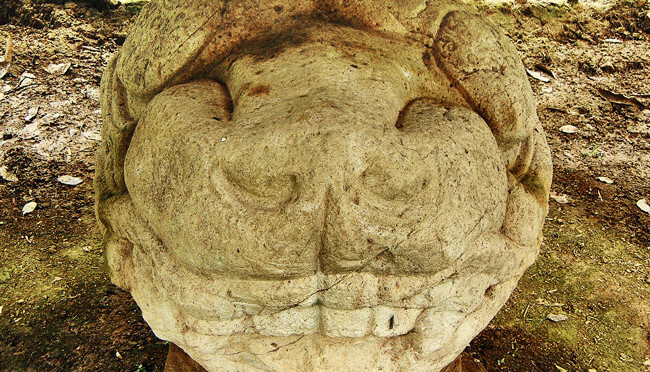 It is thought that native Mesoamerican’s were unable to grow facial hair and so any image of a beard in ancient Mesoamerican art has a tendency to raise eyebrows. As such, it is possible that Cauac Sky wore a false beard in the same way the Pharaohs of Egypt did to identify him with power. That’s our first coincidence. Fig W0968: Stela C Stela C features the Mayan Creation Myth, which tells us how at the beginning of time three stones were placed and then tied to create a new home for humanity. The stela also gives a Long Count date for this as 13.0.0.0.0, which historians have been able to determine equates to 3114BC. The story is continued in Zoomorph B, which tells us that the First Father (or first Ruler) was born from a turtle shell shortly after the stones were tied. The First Pharaoh of Egypt was Menes, who was crowned after he unified Upper and Lower Egypt sometime between 3130BC and 3100BC. Coincidently then, the Mayan date for the birth of the First Father and the Creation of the current era is the same date that the first Pharaoh was crowned. W0960C: Stela A – Headdress Having unified the peoples of the Upper and Lower Nile, the new Pharaoh, Menes, combined the crowns of the two lands to create the iconic double crown. This new crown demonstrated he was the Divine Ruler of both the Upper and Lower Nile and was worn by all subsequent Pharaohs of Egypt. For some reason, Cauac Sky started to wear a double crown at some point during his reign (fig. W0969C). The attire of Mayan rulers was deeply symbolic and everything from their ears plugs to their boots was designed to tell us about the ruler and his sacred powers. 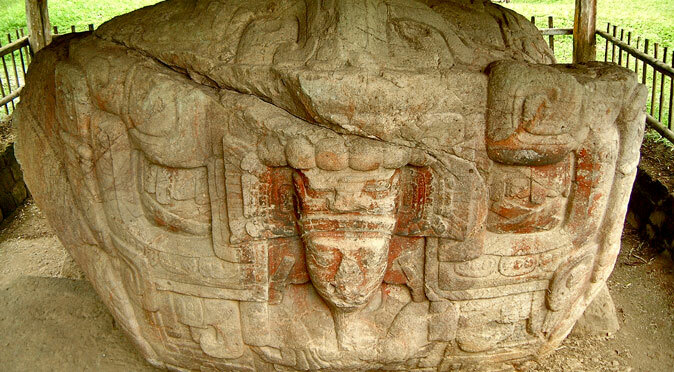 The purpose of this double crown is not known and it doesn’t seem to appear elsewhere in the Mayan world. So again, it seems Cauac Sky began to use another prime piece of Egyptian iconography by complete coincidence. Stela EThere are few things that are more iconic than the Egyptian needles or obelisks. These towering monuments were hewn from the ground as single pieces of rock. Standing as high as 105ft (36m), they were made to be visible and to recount the stories of religious order and the Pharaohs’ glory. The Egyptians also enjoyed building massive statues of themselves. The mighty monuments of Rameses II which reside outside the temple of Abu Simbel in Aswan are surely the most extreme example of monumental statue building ever undertaken, but almost every Pharaoh built at least one mighty monument to celebrate themselves. The Maya were also keen on building monuments to celebrate themselves and used a form of inscribed stone known as stelae. Typically, these were large stones between 1 and 2 metres tall that were etched in bas-relief (or low relief). The result was a flat, two dimensional image that is incomparable to the works of the Egyptians. 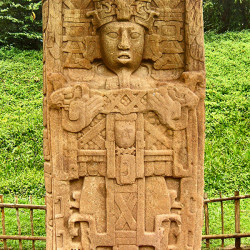 Then, in a remarkable break from tradition, Cauac Sky erected the mighty Stela E at Quirigua. This monument stands a massive 10.6 metres tall and is carved from a single piece of rock. 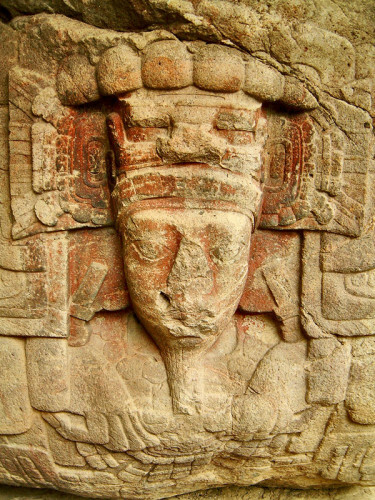 Far from two dimensional, Cauac Sky’s face protrudes in mid-relief from his headdress and then the entire imagery continues around the stelae to produce a 3D statue in a style called the “wraparound” style. Stela E rises like an obelisk and is covered in hieroglyphs that describe the achievements of Cauac Sky. It is also covered in religious symbolism and is therefore very reminiscent of the obelisks of the Egyptians. It is also a towering 3-dimensional statue of a mighty ruler, designed to impose power and look to the horizon high above the people of Quirigua, just like the statues of the Pharaohs. Although Stela E is one of several stelae and the style was taken, along with the craftsman, from nearby Copan, Cauac Sky seemed determined to create something completely new, yet very Egyptian. In summary, it is a huge monument and another massive coincidence. Fig OR10 – OrionResearch over the past few decades strongly suggests that the Pyramids of Giza, built by Khufu, Khafre, and Menkaure, are far from mortuary temples. Instead, it is though they were designed to reflect the three stars of Orion’s Belt, and sit beside the Nile River like Orion sits beside the Milky Way. This was an attempt to have the stars of the Gods’ recreated on the solid earth of Egypt1. Cauac Sky’s monumental building programme seems to have also been designed to recreate Orion on Earth and emulate the tying of the stones which was carried out by Itzamna at the beginning of time. 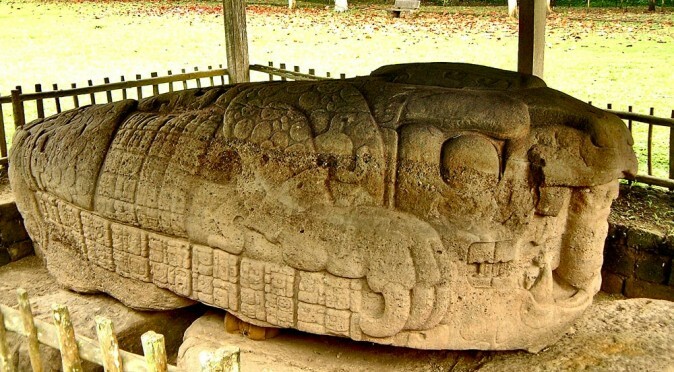 In a re-enactment of the Creation Myth, Cauac Sky had three huge stones sailed down the Motagua River (Stela C, Stela A and Zoomorph B) and then “tied” them on the banks at Quirigua, just Itzamna had tied them by the side of the Milky Way. 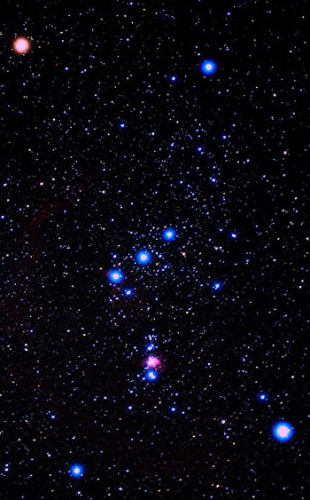 In this instance, it was not the belt of Orion, but the lower triangle of stars which symbolised the three stones of a hearth (the belt was likened to the smoke rising from the hearth). So again, coincidently, Cauac Sky performed a monumental building programme to rebuild Orion on on the banks of the Milky Way, just as they did in Egypt. Fig QUI002: Quirigua to GizaFinally, although the calculation of 7200 miles from Quirigua to Egypt was taken from Google Maps and could be inaccurate, the figure of 7200 is a key operator in the Mayan Long Count Calender. 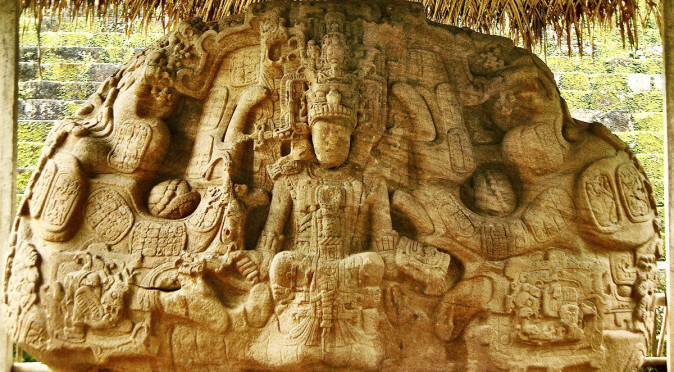 The monuments at Quirigua were erected at quarter K’atun intervals; a K’atun was a special period of time that was 20 years long, as the Maya used a 360 day year, a K’atun was 7200 days. 20 K’atuns equalled the highest denomination of time known as a B’aktun, which was 144,000 days long. 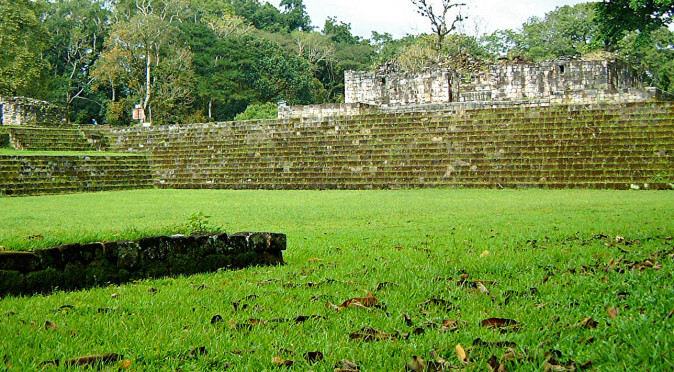 As the Maya had a 20-day week, it means a B’aktun is 7200 weeks long. 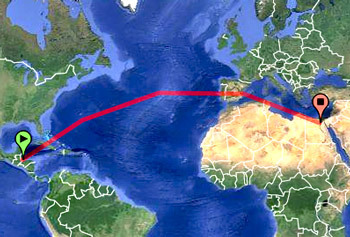 If you don’t like miles, then 7200 miles equals 11,587 kilometres. There is a scientific school of thought that suggests the Earth has a magnetic polarity cycle that lasts 11,500 years2 and could be responsible for the dramatic climate changes that occur, in particular the onset of ice ages. This could be equated to a new cycle of life as the world undergoes this incredibly destructive change. 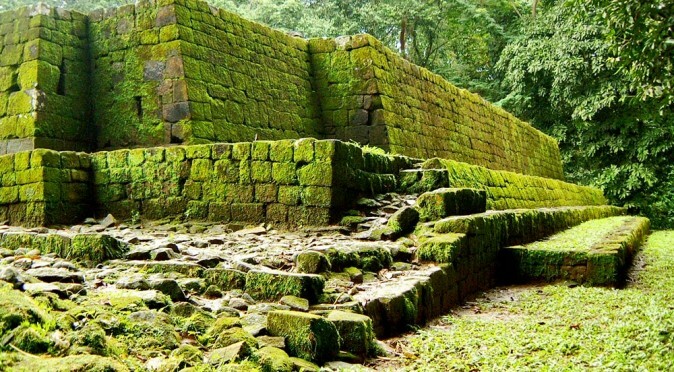 It verges on absurd to claim that the Maya built Quirigua where it is becuase the distance to Giza is the equivalent to some highly significant time cycles, but it still counts as a coincidence. There is, of course, no way there was direct contact between Cauac Sky and the Egyptians, but over two thousand years there is a chance that the legends or descriptions of the Egyptians, or even the odd hieroglyphic papyrus, made it from the Mediterranean to the Americas. There have been plenty of civilisations that were as good at sailing, if not better, than Christopher Columbus: the Athenians, Phoenicians, Mycenaeans, Romans, and even the Egyptians themselves, all had the technology capable to make the trip (this is covered in an article about the Discovery of the Americas). Then there is other possibility, that Cauac Sky adopted all of these ideas through spontaneous thought or divine inspiration – he did after all claim to be a divine ruler and he ruled for an inexplicably long tenure of over 60 years! We are left then with either an unbelievable run of coincidence, evidence of ancient transoceanic contact, or proof that Divine Rulers who are guided by spirits or Gods do exist.